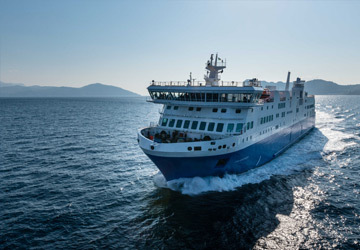 The Guernsey Jersey ferry route connects Guernsey with Jersey and is currently operated by 2 ferry companies. 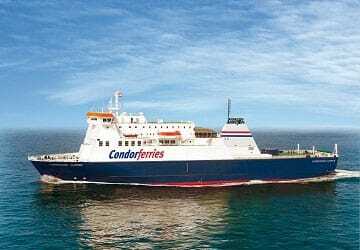 The Condor Ferries service runs up to 12 times per week with a sailing duration of around 1 hour while the Manche Iles Express service runs up to 4 times per week with a duration from 1 hr 20 min. So that’s a combined 16 sailings on offer per week on the Guernsey Jersey route between Guernsey and Jersey. Compare now and get the best fare at the time that you want to travel. Prices shown represent the average one way price paid by our customers. The most common booking on the Guernsey Jersey route is a car and 2 passengers. We booked online with little fuss, turned up at Guernsey terminal and tickets were issued without a hitch. Fast and speedy service. A very fast one hr trip that leaves at a reasonable time and arrives perfectly on time to check in at your hotel.excellent service on board and good shopping opportunities. Perfect! Good trip,boat on time and seats were easy to find. As. My wife is disabled , unfortunately lift was not working, therefore had to use stairs which she found difficult. Long walk in Jersey to terminal! Travelled as a foot passenger Weymouth->Guernsey->Jersey->Weymouth and left car at the B+B. Glad I did as carkparking in Weymouth for 3 days looked to be expensive. Check-in was friendly yet efficient. On all trips, the allocated seat was in the upper lounge and due to slight knee problem, I asked to be moved to lower. This was done immediatley with no fuss. Did not eat on board but had a couple of coffees at "Costa Cafe" not too expensive. The weather outbound was a little choppy but the "SuperCat" coped very well with little movement. I was advised by phone that due to expected bad weather on Saturday, the Jersey->Weymouth leg was to be brought forward to 08:50 from 14:35. This allowed hardly any time in Jersey. So I asked if the Guernsey->Jersey leg could be brought forward. Again excellent customer services changed the booking at no cost. All in all a really enjoyable experience and would go again in the summer! From the internet booking to crossing everything worked out well. I can only recommend and happy again. 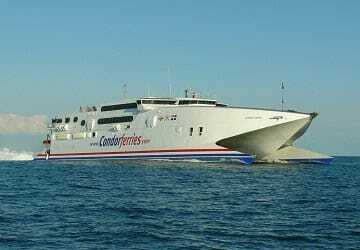 "St Malo - Guernsey - Jersey -St Malo"